This blog has been lying dormant for too long. This will be my first post in more than a year, and I hope I’ll post more regularly going forward. Acerbus is a young and promising extreme doom metal band from Delhi, India, started in January 2012. In a country plagued by generic metalcore, trendcore, applecore, manticore, haramcore, a band playing sick, twisted music is like a breath of fresh (filthy, rather?) air. Acerbus came together to unleash the desire to play doom metal. They are heavily influenced by death/doom, funeral doom and sludge bands like diSEMBOWELMENT, Worship, Stabat Mater, Incantation, Wormphlegm, Coffins, Khanate etc. The first single, Chamber of Decrepitude(available as a free download via their bandcamp), is a very dirty, demented, dark and stark track of over 12 mins and works like an ominous herald of their consequent debut demo, which is to be released in a few months. Ankit Sinha’s (curator of the mighty impressive Infernal Dominion blog and podcast) filthy, acerbic vocals and the plodding, restrained drumming of Mohammed Kabeer is of particular interest. The production is also appropriately muddy, inducing the listener to visualize wading through a sludgy swamp. A pretty impressive first single, in my opinion and I shall be following this band with keen interest in the future. More power to the burgeoning doom movement in India! As in each year, this year too IIT-B managed to get a premier niche band,Katatonia, to perform for Mood-I. And, as in each year, this year too IIT-B managed to let the general crowd in after the 1st band, Abraxas, had finished their set. Abraxas was the eventual winner of the Livewire competition which also had Goddess Gagged, Purple Asparagus andGuillotine in contention. All these bands were allowed to play a very short set, which didn’t allow us to judge them properly. The old stalwarts of Indian Rock, Indus Creed, were up next with a new bassist, Rushad Mistry (of Agnee) and a new drummer, the excellent and prolific Jai Row Kavi (ex-Agnee, ex-Pin Drop Violence, ex-Helga’s Fun Castle, Tough on Tobacco, ex-Bhayanak Maut). They played an hour-long set containing a mixture of old favorite tracks like Rock & roll renegade, pretty child and Top of the Rock, and some new tracks (the names of which I didn’t catch). In the entire set, it was very evident that the old guard (Uday Benegal, Mahesh Tinaikar and Zubin Balaporia) had lost none of its edge and did an excellent job of connecting with the crowd. Zubin’s and Mahesh’s intermingling solos with their respective instruments were particularly delightful. It was really heartening to see a nearly 3-decades old band truly enjoying themselves and rocking it out on stage like teenagers. With the exit of Indus Creed to a thundering applause, a palpable pall of chill & doom descended and an almost tangible cord of tension was felt running through the expectant crowd. Katatonia took their time to arrive on stage, but when they did, they did with an explosion of Day & Then The Shade, which was quickly followed by Liberation and My Twin. They didn’t waste time belting out a mindblowing 17 track assault which spanned a rapturous 1.5 hrs. The set seemed like Katatonia’s Best Of compilation with tracks from The Great Cold Distance, Viva Emptiness and Night Is The New Day. They played Viva Emptiness almost in its entirety, and it’s my most favorite Katatonia album! The tracks July and Teargas got the most crowd response, and it was kinda interesting to see females in the crowd moshing about. The sound of the entire show was impeccable, the crushing downtuned guitars rooting all of us in our places, and Oh!, the mournful, soulful vocals of Jonas Renske! The vocals of Renske need a special mention. They were like aurora borealis floating and shimmering over a tumultuous ocean of thundering riffs. Katatonia ended their set withJuly, Forsaker and Leaders and I glimpsed at my friend and he was actually weeping. That was effect Katatonia had on the crowd yesterday. A thoroughly professional and mesmerizing performance by Katatonia, made even more praise-worthy by the fact that they played 6 gigs in 9 days. Their No Sleep Till Tour 2010 actually lived up to its name. Those who missed the gig, I can only feel sad for you, ‘coz you missed something which I don’t think you will experience again. 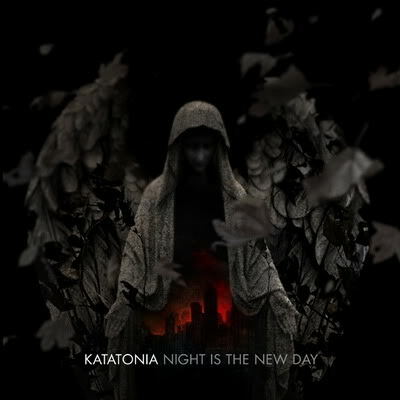 21/12/2010 was the day when a few hundred people transcended this world to the surreal music of Katatonia. Even if Katatonia comes back to India, don’t think they will play a 1.5 hrs set. At last, India wakes up to Black Metal and we are having new bands exploring the dark side of music. Heathen Beast, the newest addition to the burgeoning music of the netherworld (Underground Music Movement is lame and passe), is a mysterious Mumbai based trio, who call themselves Carvaka (vocals/guitars), Samkhya(bass) and Mimamsa(drums). Unlike the usual anti-Christ or Satanic lyrics abundant in BM, Heathen Beast proclaim to be atheists and claim to deal with subjects relevant to India and its culture. Their debut EP, Ayodhya Burns, releasing tomorrow (which happens to be the 2nd anniv. of the Mumbai terror attacks) as a free download, is “a tribute to all the Indians who have lost their lives in the name of religion”. It’s a small 3-track affair, but it doesn’t fail to impress. The pummeling riffs and overwhelming blast-beats in the album opener, Blind Faith,leaves you feeling like you just slammed into a wall at 100kmph. The riffs have an unmistakeable Indianness to them. The following track, Religious Genocide, follows in the same vein with Mimamsa pounding the hell out of the drums and Carvaka shrieking his guts out. There’s an underlying melodic feel to it, which makes it a bit accessible too. The last track, Ayodhya Burns, opens serenely, Vedic chants in the background, all to be blasted wide open by some very chaotic maelstrom of blast-beats, tremolo pickings and gut-wrenching howls. The only discernible downside I found in the material was the low vocals in the mix. Need to tweak around with the media player to hear the shrieks clearly. As this is through-and-through black metal, this EP isnt for everyone (black metal never aspires to be popular anyway, heh). But, those having minds with an evil bend, head over to http://www.reverbnation.com/heathenbeast and get your copy of this piece of emerging Indian BM. The annual metal juggernaut, The Fall Metal Explosion, hits Pune on 2nd November. 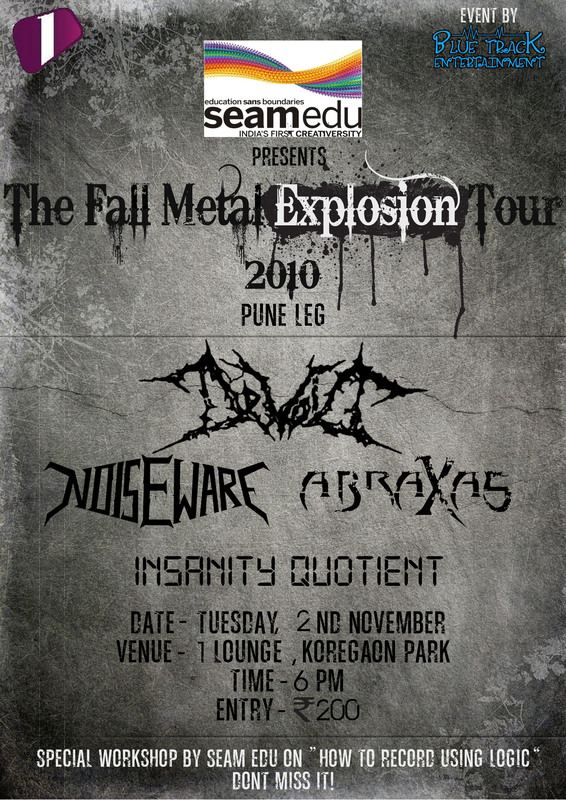 The first decent metal gig in Pune after ages features a killer line-up – Devoid, Noiseware, Abraxas and Insanity Quotient. It will be Mumbai based death-thrash band Devoid’s first gig in Pune, after tearing up Blue Frog and B69 in Mumbai in two close gigs. You can read up about the Blue Frog gig here. If the Blue Frog gig was any clue, Devoid’s Pune set has the potential to bring down the place. This will also be Devoid’s kickass debut album, A God’s Lie’s Pune launch, the CDs of which will also be available at the venue. The rest of the bands are my favorite Pune bands with Abraxas alone capable of brutalizing the place. With them teaming up again with Noiseware and Insanity Quotient, the Pune metalheads can expect a gig nothing short of pure madness. I only hope there’s a huge turnout and the Pune crowd doesn’t disappoint. 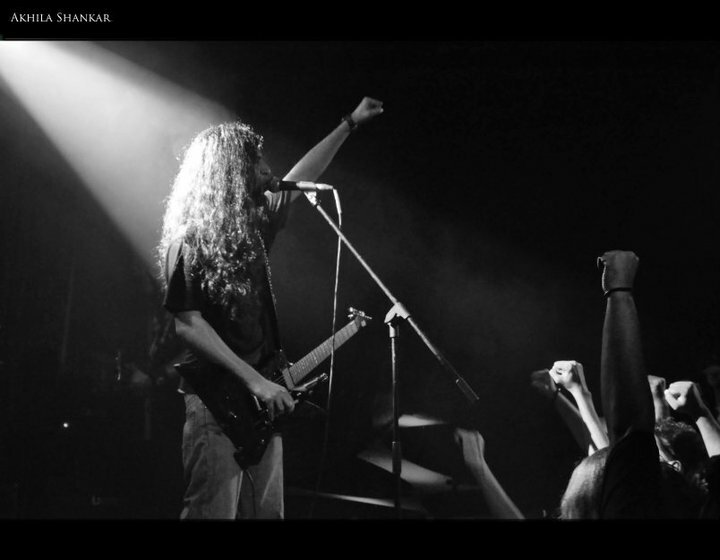 Every average Pune metalhead has heard the Pune bands, but they have to get a piece of Devoid. This is one band which I know will make it big. And this gig will surely be remembered as the gig where Devoid slayed the Pune metalheads. October 3rd was a date that was much awaited since the schedule for Dinner Is A Lie(Albatross, Devoid and Nervecell) tour was announced. However, the Ayodhya verdict threatened to throw an ugly spanner in the works. 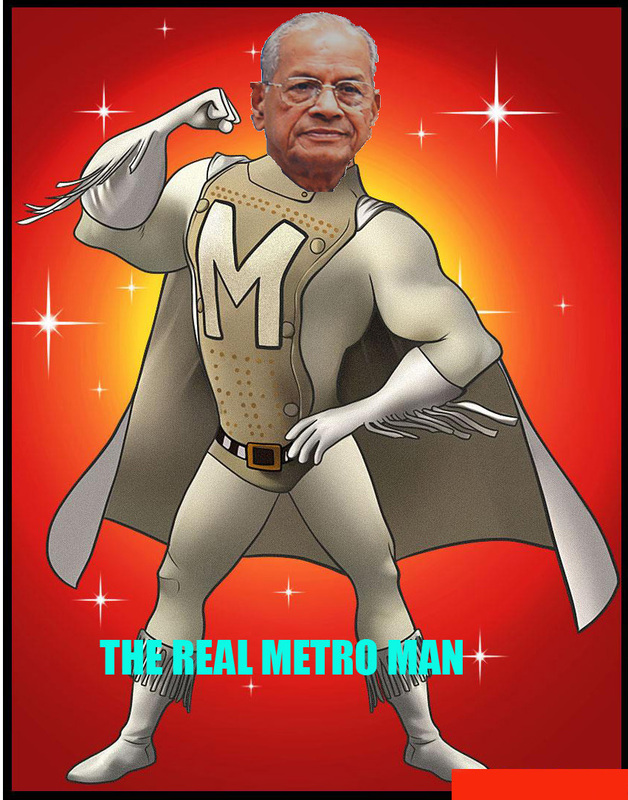 But, thankfully, the Indian public kept its head and the verdict went through without a hitch. The debut Devoid album, A God’s Lie, I got in the mail a week before the gig just added to the impatience. So, on the morning of the gig I caught a rickety bus from Pune to Mumbai for a gig I knew wouldn’t let me down and spent the day with a few close friends. Thanks to the infamous Mumbai traffic I managed to reach the venue, Blue Frog, Lower Parel, just as Devoid were about to start playing. Before I start telling you about the gig, a few words about the venue seems suitable. It took me more than a few wrong turns to get to Blue Frog. But, once inside, you know this is the venue for a nice metal gig. The sound system is topclass, there is enough space for the band on the stage and ample space in front of the stage for a decent pit. Devoid were first up and, O boy, did they rip apart the place or what! They started off with the blistering Battle Cry after the album opener A Silent Death was played through the PA, and almost immediately moshpits and circlepits formed. One by one Devoid played the album in its entirety. After listening to the album, I knew Devoid is one of the top metal acts in the country. But, after watching them live, I realized they are also one of the better live acts in India. They are really Possessed on stage. The lead vocalist/rhythm guitarist, Arun Iyer, is a born frontman. He commands the audience from the stage like an Emperor does his subjects. Keshav Kumar and, later, Sanju Aguiar wielded the lead axe with aplomb and Frank Pawar’s galloping bass provided the perfect foundation. Devoid completed their set with the crowd favorite Beersong, to which the Hate Cult present promptly went berserk. Next up was Albatross, who had recently released their debut EP, Dinner Is You. Was it because this band had lesser crowd support or for some other reason, there were more people outside the venue smoking fags and what-not than those inside. I even saw people tying their laces in the pit! Personally, I didn’t find this band half bad. They were decent. Their sound is more traditional heavy metalish than new age metal. Albatross wound up their set with a cover of Ozzy Osbourne’s Mr. Crowley. The last act of the day was the most awaited one – Nervecell, a death-thrash metal band from Dubai. If anyone was left standing after Devoid’s set, those were annihilated by Nervecell, even those who had never ventured near the moshpit. The twin guitar assault of Barney Ribeiro and Rami Mustafa, the brutal cookie monster vocals of bassist/vocalist Rajeh James Khazaal and the thundering supersonic double bass drumming of Louis Rando were more than enough to lead the metalheads to a heightened frenzy. Their set saw the entire rigmarole of crazed metalheads – crowd-surfing, stage-diving and slam-dancing. As James put it, “The other parts where we performed in India, told us to wait for Mumbai for the real crazy metalheads. I had to wait to come here to believe that, and now I believe that. Mumbai is the f*cking Metal capital of India!” Hell yeah! I now close this account with these bootleg videos of Nervecell playing Demolition and Devoid playing Possessed. He was back. He had put all his worries behind. He was doing now what he had dreamed of doing all these years in exile. He was sitting on the recliner chair with his feet up, sipping a margarita and watching his children play in the sand. He still couldn’t believe how much James had grown up and how mature Phillipa was sounding. But, he was content. He was home. However, a tiny niggle in his mind was bothering Dom ever since he landed in USA. It was all too idyllic; everything was in place as he had anticipated them to be. Arthur’s startup Lucid Dreams Securities was thriving. Arthur, Yusuf and Ariadne were equal partners in the firm and they were providing the best services in that class. Arthur and Ariadne’s wedding was one of the shining points and the happiest moments after Dom had returned back. And, as it turned out, that was the last time all of them were together at the same place. Saito seemed happy with how the events had unfolded. Robert Fisher had successfully demerged Fisher Morrow, the energy conglomerate his dad, Maurice Fisher, had built. Eames was the most silent person there; something was preying on his mind. As Dom later found out from Arthur, Eames had been recruited by the Federal Govt. for counterespionage, and his current whereabouts were unknown. Dom was happy for all his mates. But, ever since he had landed, an idea was growing in his mind. 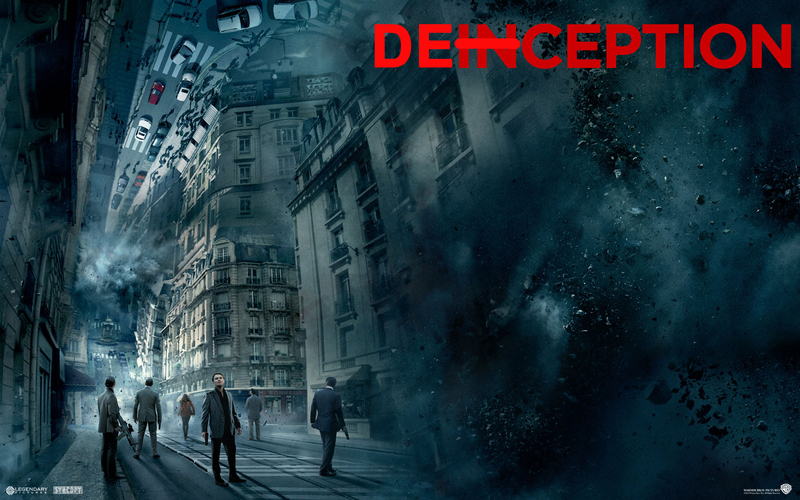 An idea which was buried deep inside his subconscious. An idea that explained his recent feelings of uneasiness and vulnerability. An idea that would change everything. An idea that said Mal was actually his militarized subconscious projection protecting him. This is a blog dedicated to the random musings I conjure in my head, my armchair philosophies, my inane thoughts on music I come across, less-than-astute observations of the movies I watch and patronising opinions of things that dont really matter. Hope you enjoy my ramblings. And, yeah, one more thing. Dont be such a fuckwit - leave a comment!